Dances, BBQ, Outdoor Movies, Bingo. Indoor Heated Pool & Spa, Exercise Room, Waterfront with Roped Swimming Area, Moorage, KK5 Restaurant, Putt-Putt Golf Course, Kamp Buildings, Tennis / Basketball Courts, Childrens Playgrounds, Heated Bathhouses with Showers in each Block, Courtesy Guest Sites, Laundry Rooms and a Chapel. Lake Merwin Campers Hideaway is a family friendly private, gated membership camping organization that offers an on-site restaurant and spa, indoor pool, outdoor movie theater, putt-putt golf, a chapel and a stunning view of Lake Merwin. Unfortunately, we do not offer access to the general public. If you are interested in learning more, please call our Sales department at 360-247-5940. We are located approximately one hour from Portland, Oregon. Lake Merwin Campers Hideaway offers the family a full range of leisure activities. You'll find hiking, swimming, boating, fishing and geocaching. We have all kinds of wildlife on-site, sometimes within steps of your own secluded campsite. Where else will you find a permanent weekend retreat or vacation spot that offers such amenities, with a variety of water sports, indoor and outdoor recreation facilities, all within minutes of Portland and Vancouver and at a fraction of the cost of a vacation home. Be sure to visit our sales page for more information on our camp and how to schedule a tour. Click the link below for directions. There are no weather alerts at this time. please let us know so we can contact the member. 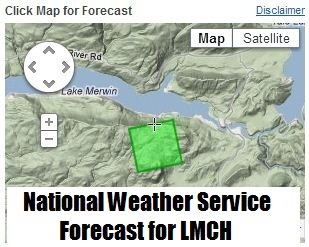 Continue to check the www.lmch.com public home page for the link to the NOAA weather report. This is set to give the conditions for our exact location. It is located in the upper left of this page. If you are in camp and get stuck in these conditions, be prepared for possible extended power and water outages. We will update this during normal business hours as conditions change. Thank you for your interest in Campers Hideaway. Thank you for visiting our website. We are a private campground. Office Hours: 8:30am - 4:30pm every Day. Click below if you would like up to the minute water level information. Click below to shop our LMCH online store! Order LMCH logo apparel and have it shipped directly to you! for current conditions before coming to the Hideaway. We reserve the right to modify operating hours in the event of inclement weather or any other event that may jeopardize the safety of our staff.